Ever played six degrees of Kevin Bacon? The aim of the parlour game is to see how many degrees you are removed from the legendary actor. My claim to fame (well, I have a couple) is that I used to work in Fopp in Edinburgh with Mark Hamilton of Woodpigeon fame. 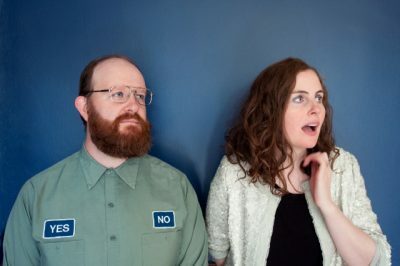 The latest news from Mr. Hamilton (who is lovely, by the way) is that he has collaborated with the New Pornographers’ Kathryn Calder on a new act called Frontperson. They’ll be releasing their first album together, entitled Frontrunner, on September 21. This is gorgeous indie-folk meets chamber pop music. So far, two tracks have been released from the record, with excellent videos to boot. First up (ok it’s been around for a bit, but I’ve been trying to get my writing head back on) is ‘Tick-Tock (Frontrunner).’ The video looks at a sports meet, but by showing it in reverse, it actually means that everyone ends equally, the same. This seems like a pretty good metaphor for life, if you ask me. The video was made by Rob Leickner and Ryan Sudds. It’s a gorgeous song, and possibly even better is ‘Young Love’ (much newer, it’s only been out for five days). It’s about having a crush on someone (we’ve all been there, so it’s pretty universal). Directed by Lorenz Trobinger (you can read about it in more detail over on Stereogum), who also stars in it, it’s simple, straightforward, and yet surprisingly affective.